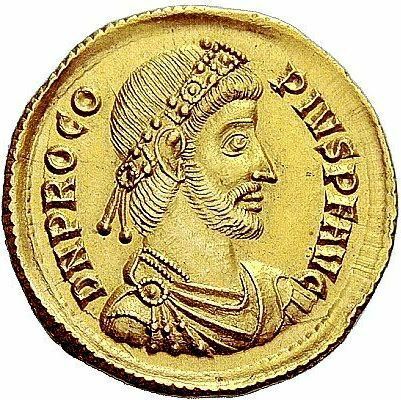 Procopius was a member of the Constantinian dynasty and a usurper against Valentinian I and Valens in 365-366 AD. According to Zosimus, Julian had given Procopius an imperial robe. When Jovian was acclaimed Emperor, Procopius gave him the robe and asked to be allowed to retire to private life. Jovian accepted. After Jovian's death, Valentinian I and Valens tried to arrest Procopius. He surrendered, but asked to meet his family; he had his captors dine and drink, and then seized the opportunity to flee with his family. He then bribed two legions at Constantinople to support his efforts, and took control of the imperial city. Shortly after this he proclaimed himself Emperor. The year after, Procopius was defeated at the Battle of Thyatira and executed.